A long time ago windows just consisted of a pane of glass and a frame to hold it in place. After improvements to the frames, such as sliding sash, came the idea of double glazing. Now triple glazed windows are becoming more commonplace. Underlying these improvements has been the need for improved energy efficiency. 60 years ago it was quite simple, does the window let in light and keep the elements out? Now that basic need has been translated into building regulations and energy efficiency standards. Do Triple glazed Windows Offer Something Extra? Triple glazing is around 40% more thermally efficient than the highest rated UPVC double glazing – which translates to a cost saving. Triple glazed doors and windows reduce draughts and cold spots, in newer homes this makes for a more comfortable living environment..
Whilst no window can be 100% sound proof a triple glazed windows and doors can reduce the impact of outside noise. Security and safety; that third pane of glass makes a triple glazed unit harder to break; either on purpose or by accident. One of the key factors in noise reduction is the thickness of the glass used. Different thicknesses of glass will block different sound frequencies, therefore combining various thicknesses of glass in a unit is very effective at keeping noise out. So in essence triple glazing offers improved thermal and sound insulation with the added benefit of improved safety and security. The enhanced energy efficiency will translate into lower heating bills which means that there is a minimal cost implication to selecting triple glazing over standard double glazing. We shall be producing more detailed information about the thermal properties of triple glazing and its noise reduction advantages. But in meantime if you would like to find out more please contact your local Cheam windows showroom and speak with one of our friendly sales staff. There was a time when you could have any colour for new windows, as long as it was white. Well now there is a much wider choice, with Grey Double Glazing being the popular choice of colour. For the last 10 years or more you will have seen a transformation in the look of windows and doors that are installed in homes and commercial buildings – Colour. It has long been accepted for commercial buildings that architects and clients choose the colour of their windows and doors and it’s rare for such buildings to have standard white windows and doors installed. Using a colour is the preferred choice. In recent years however colour has come to the forefront for British homes. It is commonplace now to see matt white, black, sage, buttermilk, heritage greens as very popular colours, as well as dual coloured windows and doors. Grey Double Glazing Windows however, is by far the most desirable colour of all. What has been behind the massive success of grey as a colour for today’s double glazing products? One reason is that the refurbishment of homes over recent years has taken on a more contemporary theme. Another is that the colour grey has been very much led by architects in the design of their buildings. Recent years have seen a boom in the building of apartment blocks all over the country and again the colour grey has more often than not been chosen as the standard colour for windows and doors. For our homes, whilst white windows and doors will always be the core product it is quite common nowadays for consumers to choose white windows with contrasting grey doors, particularly grey bifolding doors. Thinking about grey as a colour for double glazing does not instantly conjure up a positive image. However in replacement doors and windows, Grey Double Glazing Windows is arguably the most popular colour after white and one only needs to see grey windows and doors installed to see how well they work with most types of properties. 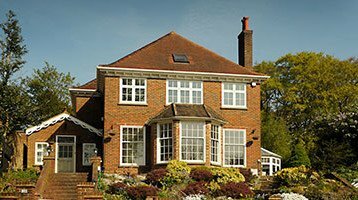 Cheam windows offer a wide range of coloured product in aluminium, pvcu and timber and each of their showrooms in Hampton Court, Worcester Park and Cheam Village. The Cheam village showroom has an excellent selection of coloured product on display. Are you are in the market for Bifolding Doors in Surrey? You will find a wide choice of product in the market. Not all bi-folding doors are the same. Bi-folding doors are an engineered product using complex slide and fold hardware. With these products it is very much a case of “you get what you pay for”. Cheam bifold Doors offer you some major advantages over the competition. Very high Security. Our unique 8 point locking system conforms to demanding, police preferred ‘Secured by Design’ standards. Industry leading Guarantee Each door set comes with a unique serial number that guarantees the doors at the property for twenty years Safety Nothing is more important than safety and comfort. Cheam bi-folding doors offer a host of features that make the doors safer. Flush floor levels. Low threshold designs allow for equal floor finishes inside and out. There are two options available; weathered and non weathered. Visually, the effect is stunning. Practically, it creates one space out of two for the ultimate use of your space at home. The best running gear. The bottom of each door section has its own long wheelbase solid aluminium carriage with four wheels that run inside a low threshold base track. Each wheel is a small work of engineering art. We use nylon type 6-6 for our wheels, a resilient high melting point material that resists degradation due to heat and friction. Low Maintenance! The nature of bi-folding doors demands precision design and engineering, making timber and UPVC unsuitable materials for maintaining alignment over the lifetime of the product. Our high grade aluminium is our material of choice because if offers the right mix of strength and weight, allowing for a narrow more attractive frame. Cheam bi-folding doors are finished with the highest grade, longest lasting powder coating available, removing the need for periodic painting and extra work. This hard wearing finish protects against scratches and colour fading, whilst keeping the doors’ original good looks. All bi-folding doors are not the same! Contact us for details of our superb market leading range of aluminium bi-folding doors in Surrey or visit our Door and Window Showrooms in Banstead, Worcester Park and Hampton Court. So is there a difference between patio doors and french doors? If your home lends itself to having brand new doors installed, which is best? Most of our homes have a lounge or a dining room with doors that lead out onto a patio or garden. Some homes and apartments will even have balconies with some sort of door leading out into open space. Patio doors have the advantage of sliding on either a single or double track. This means that the open door will not intrude into the house (open in doors) or out onto the open space (open out doors). There is a Difference between Patio Doors and French Doors ! Patio Doors from Cheam Windows are available in either upvc, aluminium or timber. Whatever material you choose, our modern thermally efficient patio doors will allow a lot of light into your home and when open will provide a wide open space to bring the outside in. Patio doors are especially beneficial to homes with restricted space. Or apartments with a small balcony where you door will be open but your outside space will not be taken up by an open door. All patio doors have safety glass and meet the very latest standards of safety and security. 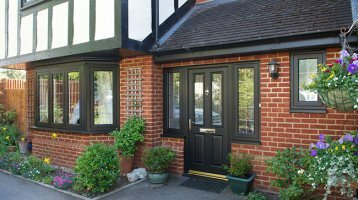 Cheam’s range of french doors are available in aluminium, upvc or timber and can open either in or out depending on your choice. Our range of french doors are available with either traditional or modern hardware with slim lines maximising glass area. Cheam Windows traditional range of french doors can have glazing bars and antique hardware for period properties. We also do modern polished and satin chrome handles and hinges to suit modern homes. All our Patio and French Doors are available in many colours, textures and finishes and are all made to measure just for you. Our showrooms in Banstead, Worcester Park and Hampton Court have a range of products for you to view and our staff will be pleased to answer any questions you may have.